The Royal is the first two-tone movement made by Waltham in the Model 1892. It had a relatively short life, found in the 7537001-7820200 range. 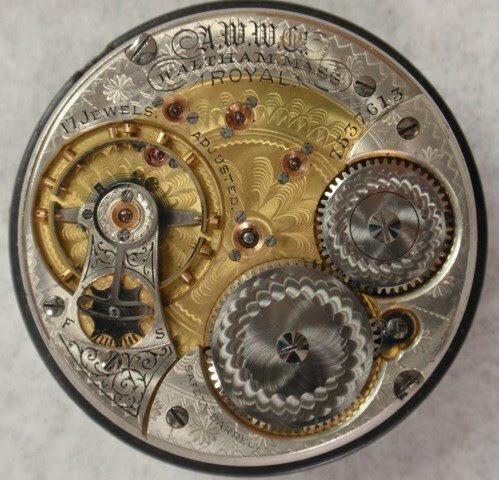 It is found in only one movement variation with the serial number next to the barrel bridge and 2 barrel bridge screws. Once again we must do some estimating when it comes to production figures as the Gray Book is misleading in two ways. First of all, the 17 Jewel two-tone Crescent Street has been reported in all but two of the Royal runs. 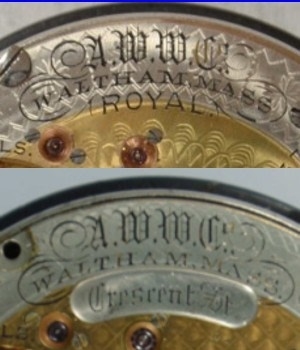 Waltham made this movement by milling out the word Royal and inserting the words Crescent St. making it one of the more interesting movements that Waltham made (see photos, bottom right). Secondly, the last 2 runs that contain Royals are 7819001-7820000 (Htg.) and 7820001-7821000 (O.F.) but these runs are listed as 17-21 Jewel Crescent Streets in the Gray Book. The table below shows the serial numbers reported to date. The runs begin with Royals and 17 Jewel Crescent Streets and finish up with 21 Jewel Crescent Streets. These factors make the task of determining accurate production figures almost impossible. The first table below shows the Royal runs from the Gray Book and the number of Royals and 17J Crescent Sts reported to date. The third table shows the runs listed as being 17-21J Crescent Sts. The actual serial numbers of the Royals and 17J C. Sts have been listed and the 21J C. Sts, which appear at the end of the runs, have been grouped.